We have four kids, six dogs and three cats. This is an amazing back up vacuum for quick cleaning and the days I don’t use my larger vacuum. The only reason I did not give it five stars is that, the bin is small and have to empty it frequently during the cleaning cycle. The Roomba 960 robot vacuum uses five times the air power for a deeper clean. It seamlessly navigates an entire level of your home, keeping track of its location and recharging as needed until the job is done. With the iRobot HOME App you can clean and schedule on the go. 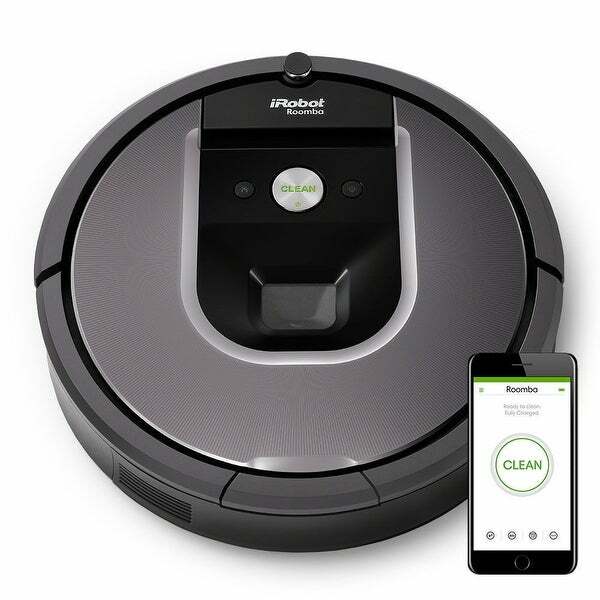 With Smart Mapping and vSLAM technology, the Roomba robot vacuum seamlessly navigates your home, keeping track of where it’s been and where it still needs to clean. The Roomba vacuum cleans continuously for up to 75 minutes, and then recharges and resumes its cleaning until the job is done. The Roomba robot vacuum removes dirt from high traffic spots of your home using patented Dirt Detect Technology. Sensors recognize areas with a lot of dirt and prompt the robot to clean there more thoroughly. At just 3.6 inches tall, the vacuum is designed to clean under beds, sofas, and other areas that are hard to reach. The iRobot HOME App lets you clean and schedule conveniently. Clean Map reports show where your robot cleaned, along with details such as coverage and duration from completed jobs. Plus, receive Push Notifications when your robot completes a cleaning job, on your smartphone. Now compatible on devices with Amazon Alexa and the Google Assistant. Use the iRobot HOME App to select custom cleaning preferences and see the status of cleaning jobs. The Roomba can be preset to vacuum up to seven times per week so your home can stay clean every day. The Full Bin indicator alerts you when it’s time to empty the bin. You can also view bin status in the iRobot HOME App. The robot automatically returns to the charging station to recharge at the end of a cleaning cycle or when the battery is running low. Designed to get floors cleaner, the AeroForce 3-Stage Cleaning System uses tangle-free Multi-Surface Brushes and Power-Lifting Suction with five times the air power to pull in embedded dirt from wherever it hides. The Edge-Sweeping Brush is specially designed at a 27-degree angle to sweep debris away from edges and corners and into the path of the 3-Stage Cleaning System to be suctioned off your floors. I returned the vac because when going from the floor to the area rug it would dump out clumps of carpet it had picked up even though we cleaned it after each use. The bin wasn't very large. It did have a lot of power, a bit more than I preferred since it was about knocking over plant stands etc. I decided on the Shark ION and love it being a bigger bin and low profile.